We want to improve your streets to encourage walking, improve access to public transport and promote cycling at a gentle pace. 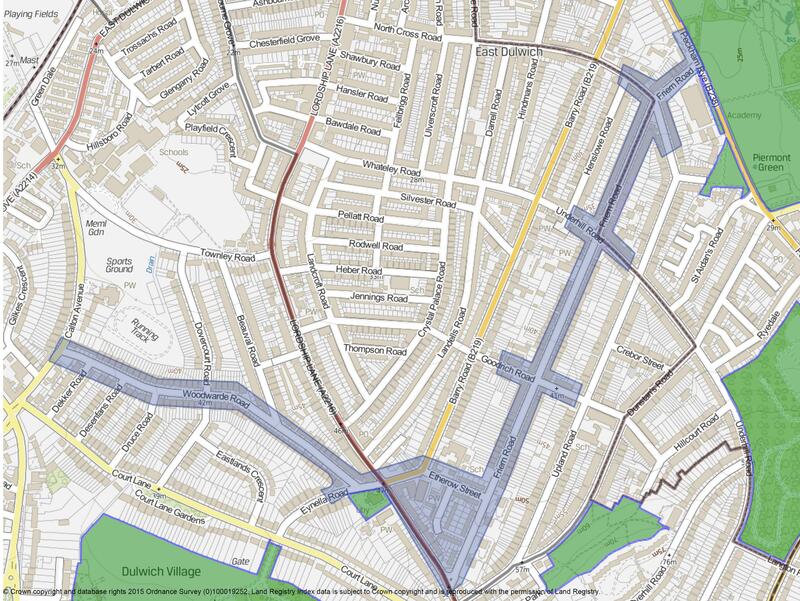 The place we are proposing to introduce changes is shaded blue on the map and is based on a proposed Quietway route from Peckham Rye to Wimbledon Chase. Quietways are based on TfL’s Healthy Streets approach which aims to improve the quality of the public space to make walking and cycling pleasant and enjoyable, improving the health of local residents. The part of the scheme Southwark is responsible for is limited to Peckham Rye, Friern Road, Etherow Street, Barry Road, Lordship Lane, Eynella Road and Woodwarde Road. The route continues from Calton Avenue via Turney Road into Lambeth, ending at Wimbledon Chase. The Calton Avenue - Dulwich Village –Turney Road section of the Quietway route is already improved as part of Quietway 7. The areas we are particularly interested in improving are the junctions listed below. Residents and the local community will be able to influence the concept designs by telling us about your experience of using the streets, about issues relevant to you and how you think we could improve the street. We will finish gathering information on Wednesday 31 May 2017 so please submit your comments by that date. To gives us views for specific locations in the area we want to improve, please visit our consultation map in commonplace here. Alternatively you can use an online questionnaire by clicking Tell us what you think below. We plan to engage with you from April 2017 to February 2018, taking into account school holidays. Please refer to the attached engagement plan for more details. We plan to engage with you from April 2017 to February 2018, taking into consideration school holidays.